Fintech innovation has evolved over several years. However, it's only recently that fintech has started to achieve its potential to transform the legacy global financial services sector. The Internet of Things (IoT) -- devices that can handle a range of Machine-to-Machine (M2M) and human-machine interactions -- enable a variety of offerings that rely on new technologies. These now form distinct technology platforms for online payments, and other financial functions across the IoT, which can be considered distinct from fintech in general. The ability to use connected objects to pay for things has been a key component of the IoT concept for many years. These can vary from using an IoT device as a discrete method of payment -- such as an NFC-enabled wearable -- to automated payments based on the state of the object being measured through various sensors. According to the latest market study by Juniper Research, the IoT payments market will grow at an average of 75 percent per year over the next 5 years, reaching $410 billion by 2023. This is up from an estimated $24.5 billion in 2018 -- and the most growth will come from in-vehicle payments. Juniper analysts have found that the automotive sector will become the most lucrative IoT platform by 2021, accounting for $63 billion in transactions that year and 55 percent of the overall market. That's compared to just over $50 billion for connected home devices, including smart speakers and TVs. However, car-based transactions will mostly include payments for fuel and tolls, but little increase in spending overall. Meanwhile, smart speaker voice-enabled commerce transactions are forecast to reach $51 billion annually by 2023. Goods purchased through these devices will account for just under 12 percent of connected home transactions by volume over the next 5 years. According to the Juniper assessment, the majority of these purchases will be for digital content, typically made through connected TVs. "Full financial service products will be slow to come to voice commerce, as the automated processes need to satisfy compliance requirements," said James Moar, senior analyst at Juniper Research. However, with voice assistants already supplying advisory and finance updates, there will be much data to draw on once the regulatory requirements are established and met by service providers. 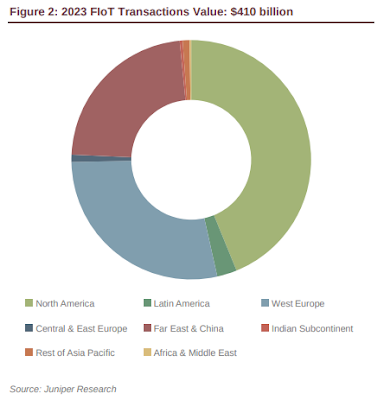 Juniper found a significant opportunity for vendors in the IoT-enabled insurance market -- which will exceed $334 billion by 2023, primarily through telematics-based motor policies. However, this evolution will likely reduce insurance premiums -- impacting insurers’ gross revenues. Juniper believes that this decline in premiums will be offset by improved overall profitability due to reduced costs per claim. This anticipated transformation will become more immediately evident in homeowner insurance, with automated accident prevention enabled through the appropriate IoT-based infrastructure.